It is just a day before Thanksgiving and everything is festive. It's 26 degrees, but cozy and warm inside our home. It is hard to imagine a house this size with just the fireplaces for heat, but that is what they had back in 1892. The big Christmas tree is up now in the foyer. As you climb the grand staircase, you see it from all sides. The sight is breathtaking and its scent permeates the room! You can feel Christmas coming around the corner. To add to the ambience, two more trees are arriving soon for other rooms. Right now, Brandon is in the kitchen making a batch of cinnamon chip scones, a guest favorite. We are working hard on the Castle Cookbook series. There's still lot's of work left to do, but what fun it is to test out the recipes. Some guests that stayed at the Castle earlier this year while visiting family in La Crosse brought us a wonderful cookbook today. So tonight we will be reading it. Thank you, dear friends! La Crosse is busy with holiday markets, and decorations are going up quickly. If you have not seen the Rotary Lights display, it's truly amazing. It's one of the biggest light attractions I've ever seen. 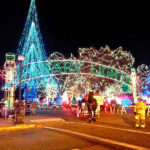 Held annually, the Rotary Club decorates Riverside Park with four million sparkling lights along the Mississippi river. The drive inside the park takes about a half hour and is free. However, if you'd like, you may donate canned goods or cash. All proceeds help fund their charity work. Don't miss out! Check out our rooms and book with us today! We share greetings with you from the Castle and wish all of you a wonderful weekend!